Next year's federal mandate strongly endorses the value of the ANSI 107 standard for protecting workers in low-light roadway conditions. AS the November 2008 deadline approaches for compliance with the Federal Highway Administration's new high-visibility mandate, it is critical that individuals in affected industries know how they will be affected by the changes to come. Affected occupations include road workers and first responders exposed to the low-visibility hazards of moving vehicular traffic. Agencies to which the mandate applies should understand the new requirements and the options available to make the best choices for worker safety, compliance, and, not least, comfort. The federal mandate is an important development because it reflects FHWA's commitment to emphasize the need to be seen as a critical issue for worker safety on federal-aid highways. It also strongly endorses the value of ANSI 107 as the baseline for helping to protect workers in hazardous, low-light roadway conditions. As they prepare for the November 2008 compliance deadline, occupational industry specifiers should become familiar with the high-visibility safety solutions available to satisfy both the regulations and the specific needs of their workers. One of the most important attributes to workers is comfort, and this can be achieved within the ANSI 107 standard if the right garment is chosen for the right application. In general, employers typically think of safety vests when they think of compliance with ANSI 107. Vests might be the right choice in some instances, but they may not always be the best choice when it comes to worker comfort. It is important to remember that ANSI 107 is an apparel standard and allows for a much wider range of choices than just vests. When selecting high-visibility apparel, it is critical to consider specific worker needs: The key is to select apparel that offers optimal visibility plus comfort for daytime, low-light, and nighttime conditions in a variety of work environments. Employers can assess their worker needs by referring to Appendix B of ANSI/ISEA 107-2004 for performance class selection guidelines per work zone conditions. States and other agencies have until Nov. 24, 2008, to comply with the provisions of 23 CFR Part 634, which the Department of Transportation's Federal Highway Administration established on the same month and day in 2006, requiring the use of high-visibility safety apparel for workers who are working within the rights of way of federal-aid highways. In its final ruling on worker visibility, FHWA noted that high visibility is one of the most prominent needs for workers who must perform tasks near moving vehicles or equipment. "The need to be seen by those who drive or operate vehicles or equipment is recognized as a critical issue for worker safety. 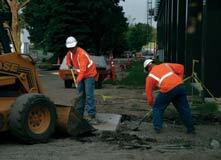 Because workers must devote their attention to completing their assigned tasks and might not completely focus on the hazardous surroundings in which they are working, it is imperative that the approaching motorist or equipment operator be able to see and recognize the worker," FHWA wrote in the rule. In its research on the use of hi-vis safety apparel in construction and maintenance work zones in 30 states, FHWA found that more than 90 percent (28 out of 30) of the states' DOTs have already adopted policies that require highway construction and maintenance workers in highway work zones to wear high-vis safety apparel. Also, most agencies specify the ANSI Class 2 standard and are furnishing the apparel for their own employees. The impending law specifies that affected workers must wear safety apparel that meets the Performance Class 2 or Class 3 requirements of the ANSI/ISEA 107-2004 standard but otherwise leaves design features open for agencies to specify to meet special needs. If an employer determines that the material must be fire resistant, for example, it can include a provision in the specification for the garments that it purchases. The standard for Class 2 or 3 permits lime green, orange, or a combination of the two colors. Employers have flexibility to specify either of these colors or a combination. The importance of comfort as a consideration in worker apparel was reflected in a 2002 survey commissioned by the International Safety Equipment Association. This survey found that lack of style and comfort was a key reason why some workers did not wear safety vests up to one-quarter of the time.4 Similarly, St. Paul, Minn.-based 3M conducted a high-visibility T-shirt field test program from July 2005 to June 2006 aimed at understanding the importance of apparel selection when addressing worker comfort. When surveyed, a majority of the 158 T-shirt wearers participating in the field test found high-visibility T-shirts more comfortable than a traditional safety vest. While traditional vests still have a place, they are now being supplemented or replaced with a surprising range of new choices. For example, in warm weather, employers can choose garments with reflective materials and ultra-lightweight knit fabrics or blends designed to accelerate the evaporation of body moisture; such garments are available from several apparel manufacturers. For cold weather, specifiers should provide workers with garments made with warm, lightweight, and comfortable insulation. These insulated, high-visibility garments are likewise available from several garment manufacturers. "Innovative materials are now being fashioned into an expanded variety of worker garments, including short- or long-sleeved shirts, shorts, gloves, headgear, jackets and parkas that provide enhanced visibility in low-light conditions, as well as maximize comfort, even after frequent launderings. These options make it easier than ever to move beyond the vest and select the right garments for the job," said Gary Pearson, marketing manager for 3M Visibility and Insulation Solutions. As supervisors and safety professionals look to select the right garment for the right job, it is important to remember there are many considerations and options for comfortable, compliant, high-visibility apparel. First, make sure to obtain and review copies of relevant standards and regulations to help guide decisions. Next, conduct a work-site survey to determine which workers are most at risk. Once this audit is complete, select and design garments for workers based on work environment and needs for design functionality, comfort, durability, and appearance. Following the selection of the right garments, write a specification based on specific performance criteria for each garment type. Finally, provide training to workers to explain the purpose and proper use of the new work-wear garments. Doing a proper job in selecting the right high-visibility apparel for workers is the right step toward compliance with the FHWA mandate and all other relevant safety standards, too. Prior to the publication of ANSI/ISEA 107-1999, there was no regulation or guideline for the design, performance, or materials for high-visibility apparel in the United States. Since then, however, the voluntary industry consensus standard has been widely recognized by federal, state, and local authorities, as well as private entities. Specifying minimum amounts of retroreflective materials, colors, and placement of materials for hi-vis worker apparel, the standard defined three garment classes based on the surface area of background and retroreflective material used to make the garment. ANSI 107-2004 revised that first edition. Significant changes to the 1999 edition included the addition of headwear to the list of high-vis products covered, inclusion of reflective patterns such as logos, the distinction between woven and knitted fabrics as background material, and a general honing of the three garment classes based on the wearer's activities and determined by the total area of background and reflective materials used. • Class 1 garments are defined as apparel for use in activities that permit the wearer's full and undivided attention to approaching traffic, with ample separation of workers from traffic. Parking lot attendants and delivery vehicle drivers are examples of workers who should wear Class 1 garments. • Class 2 garments are defined as apparel for use in activities where greater visibility is necessary during inclement weather conditions or in work environments with risks that exceed those for Class 1. Garments in this class cover workers (survey crews, school crossing guards, airport baggage handlers, railway workers) who perform tasks that divert their attention from approaching traffic or that put them in close proximity to passing vehicles. • Class 3 garments, providing the highest level of visibility, are defined as apparel for workers such as emergency response personnel and roadway construction flaggers who face serious hazards and have high task loads that require attention away from their work. These garments should provide enhanced visibility to more of the body, such as the arms and legs, making the wearer conspicuous through the full range of body motions.